BOSSIER CITY, La., Dec. 13, 2013 – McElroy Metal has just released its updated company product brochure. 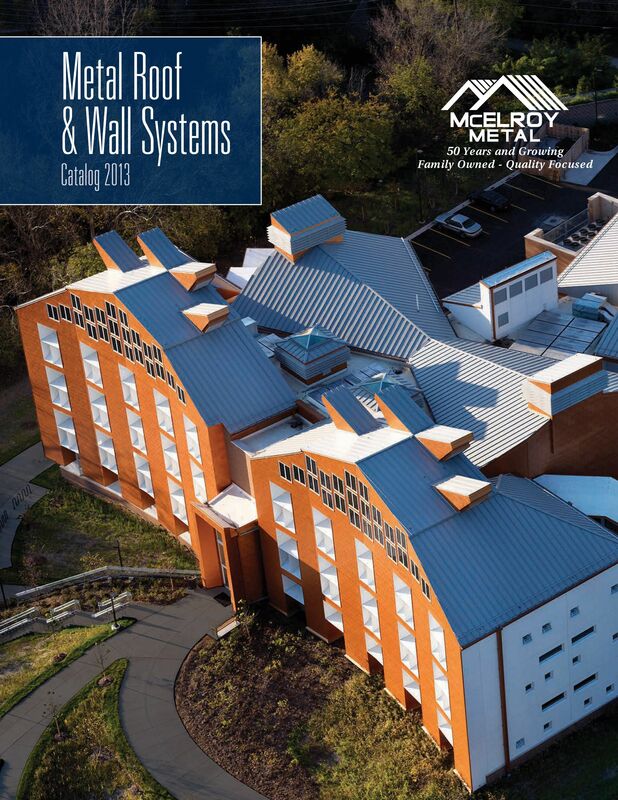 The 36-page brochure features the entire McElroy line of construction products and components for the architectural metal construction industry, including up-to-date information on its most recent product addition, the 138T and 238T standing seam systems. These symmetrical standing seam systems offer many advantages including unsurpassed strength, individual panel replacement capabilities and reduced installation/labor costs. The new brochure also includes information on retrofit options. McElroy Metal offers a variety of engineered systems to adapt to an existing roof’s structural support system, whether constructed of steel, concrete or wood. Among the other newer company offerings featured include insulated metal panels under the name of Green Span Profiles, a joint venture IMP manufacturing company. The brochure highlights the company’s proven standing seam systems, concealed fastener wall panels, exposed fastener roof and wall panels as well as soffit and fascia offerings. To have a hard copy of the brochure mailed to you, email a request to info@mcelroymetal.com. To obtain a PDF online, visit www.mcelroymetal.com/elements/files/MM1011113.pdf. Since 1963, McElroy Metal has serviced the construction industry with quality products and excellent customer service. The family-owned components manufacturer, headquartered in Bossier City, La., has 12 manufacturing facilities across the United States. Quality, service and performance have been the cornerstone of McElroy Metal’s business philosophy and have contributed to the success of the company through the years. As a preferred service provider, these values will continue to be at the forefront of the business model along with a strong focus on the customer. More information can be found at www.mcelroymetal.com.